Excessive Spacing: Results when teeth fail to erupt (grow in) or there is a difference between the size of the jaw and the size of the teeth. Excessive spacing allows teeth to shift affecting the bite and dental midlines. Crowding: Results due to a lack of space for teeth to fit normally within the jaw; there is a difference between the size of the jaw and the size of the teeth. Crowding could lead to other issues such as impacted teeth, abnormal eruption of teeth, trauma to neighboring teeth, or periodontal (gum) issues. 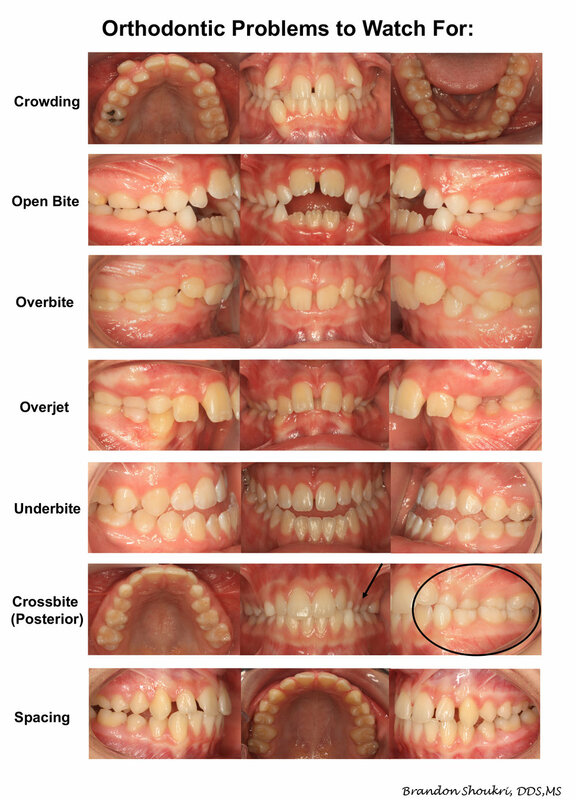 Open bite: Insufficient vertical overlap of the upper and lower front teeth. Open bite may lead to a number of unwanted habits such as tongue thrusting where the tongue protrudes forward when swallowing or speaking. The mismatch in growth of the upper and lower jaws or a constant thumb sucking habit that lasts beyond the age of 5 are common contributors to an open bite. Underbite: The positioning of the lower teeth and jaw extends too far out, causing the lower front teeth to sit in front of the upper front teeth. This problem can be fixed with braces or dental facemasks, which help bring the upper teeth forward in front of the lower teeth so they fit in a stable and comfortable position. Overjet (protrusion of upper teeth): The upper and lower front teeth do not come together when biting. This could be the result of oral habits (e.g. thumb sucking), a skeletal discrepancy (e.g. improper development of the lower jaw in relation to the upper jaw), or a dental issue (e.g. missing a single lower tooth or multiple lower teeth). Deep Overbite: The upper front teeth cover the lower front teeth excessively, which could affect lower jaw development and movement, lead to excessive wear of the front teeth or trauma to the tissue covering the roof of the mouth. Crossbite: The upper teeth sit inside the lower teeth or there is a misalignment of the dental arches. When individuals with crossbite try to close their mouth, they tend to move their lower jaw forward or to the side when closing. This incorrect bite may lead to craniofacial asymmetry and/or other lower jaw issues. My child was born without permanent (adult) teeth; is this common? More than 20 percent of adults fail to develop at least one of the thirty-two permanent teeth. Research studies have shown that congenitally missing teeth are associated with genetic factors, a result of a syndrome, or a sporadic issue. The most common congenitally missing teeth are: wisdom teeth, mandibular second premolars and maxillary lateral incisors. With a simple panoramic x-ray, an orthodontist would be able to provide you with information on which permanent teeth are present in the oral cavity. This will give the orthodontist an opportunity to determine how to achieve the best results in the most efficient way. Absolutely not! There is no age limit for orthodontic treatment. The opportunity for you to achieve a healthy and beautiful smile is always available to you. Over 25 percent of the patients of most orthodontic practices are over the age of 18. You can have the smile you’ve always wanted no matter what your age is. If you are worried about esthetics; you have the option of having tooth-colored braces, braces that go behind the teeth, and plastic-like aligners (e.g. Invisalign®). It is important to know that not every type of appliance is suitable for correction of every kind of orthodontic problem. It is in your best interest to visit your local orthodontist to evaluate what your options may be. Dr. Brandon Shoukri is a Diplomate of the American Board of Orthodontics. He is an orthodontist at Berkman + Shapiro Orthodontics in Commerce Twp, MI. He is also an adjunct clinical assistant professor at the University of Michigan School of Dentistry and serves on the board of Michigan Association of Orthodontists. If you have any questions, you can reach out to Dr. Shoukri at bshoukri@gmail.com.